The holiday season is approaching, and in our classrooms, many activities revolve around family, family gatherings, giving to others and diverse celebrations. Our meeting discussions, books and activities stimulate many conversations about families. We find that children return to their photo albums to share family experiences together, and we’ve use books about diverse families to motivate children to draw their own families, and to think about the people they love who they consider family. For some in these discussions, family is the people (and pets) that live together, but for many children even the first family discussions include grandparents, cousins and other extended family. At this time of year, when so many children travel or participate in hosting extended family for gatherings, the concept of family extends. Starting from this family focus, we begin to encourage children to extend their connections from family to a wider community. The school community also has people who care for each other, and offering opportunities to connect as a whole school gives children a concrete way to deepen relationships here. Our seasonal “feast” is one of the first whole school events that children plan, prepare for, and then enjoy together as a caring community. We want to encourage children to give something of themselves (their time, their conversation, their ideas, their food and gifts) as we come together to celebrate. Our feast is a time for the whole school to gather for a special snack and sharing. We meet in the kindergarten room, share foods prepared with the children, sing songs, and participate in a traditional “give away” (a Native American custom of distributing gifts to the whole community). During the two weeks or so before the feast, children help plan and then cook food, (this year green beans, carrots, trail mix, apple sauce, and more). We make gifts so that each child will both give and receive gifts from other children (this year painted pine cones, necklaces and book marks). And we learn songs and games that we can enjoy together at the feast and throughout our school year together. At the same time we talk about sharing ourselves with others, we encourage children to stretch their ideas about community even wider. This is a good time of year to begin to talk together about the neighborhoods we live in, and our connections to that wider community. And as we think about what everyone needs to feel safe and happy, we can start to talk about ways we can help our neighbors who might need something we can give. One concrete way to do this is to ask families to support our giving projects for local food pantries serving the communities in which our children live. We begin at this time of year, but hope to continue right through the school year, with the generous support of our families. Children are encouraged to bring in a donation, and then work together to sort and bag whatever comes in, so that it’s ready to give. This year’s feast was the culmination of lots of work and caring on the part of the children, full of conversation and good will. We wish all of you a peaceful holiday season! 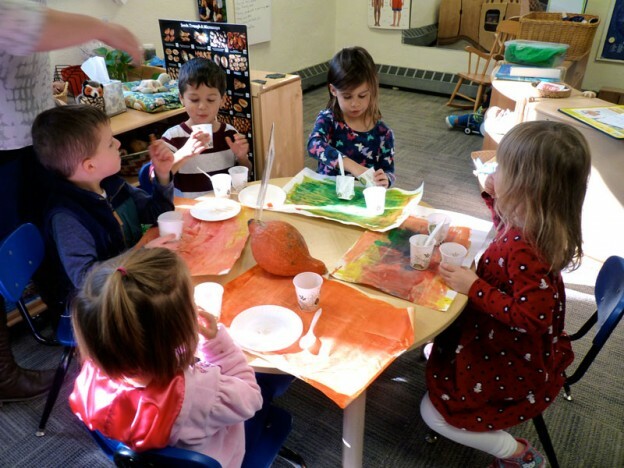 This entry was posted in Celebrations, Education, Philosophy and tagged children, education, learning, preschool, social studies on November 25, 2015 by Katrina Selawsky.